The construction phase of the Marriott International Headquarter development site is underway. Equipment and material deliveries, environmental and safety controls, excavation, hauling and drilling operations continue as trucks enter and exit the site along Woodmont Avenue. This week, workers began drilling and driving pilings into the foundation, which will continue through next week. Along Woodmont Avenue in front of Garage 11, the restoration of pavers and concrete along the sidewalk and street will be completed next week, as well. Tomorrow, October 6, there will be no lane closures to interrupt access to and from the Taste of Bethesda event taking place nearby. 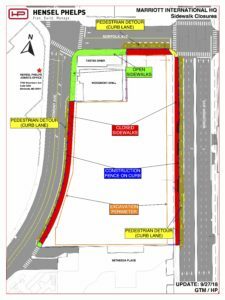 Following the event, the previous lane and sidewalk closures will resume along sections of Woodmont, Norfolk and Wisconsin Avenues. 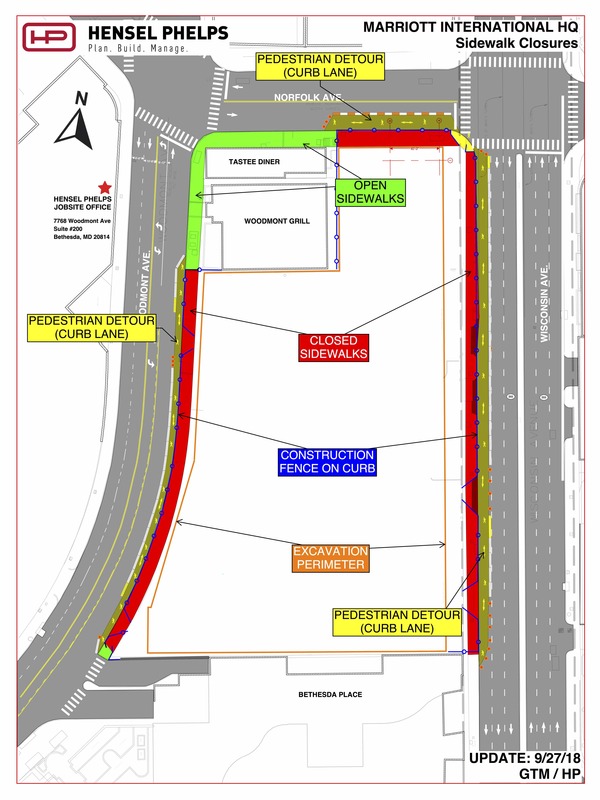 These closures provide access for construction activities, as well as safe pedestrian passage, as outlined in the diagram below. As a reminder, please pay close attention to newly posted signage and be alert for flaggers, as they are there for the safety of all of us. We are aware of utility service outages that occurred earlier in the week, including disruptions to power, signaling and natural gas, however, these were completely unrelated to the Marriott project. Any anticipated and scheduled outages required will occur at a later date and expressly communicated with all stakeholders. You will continue receiving information via these emails, as well.